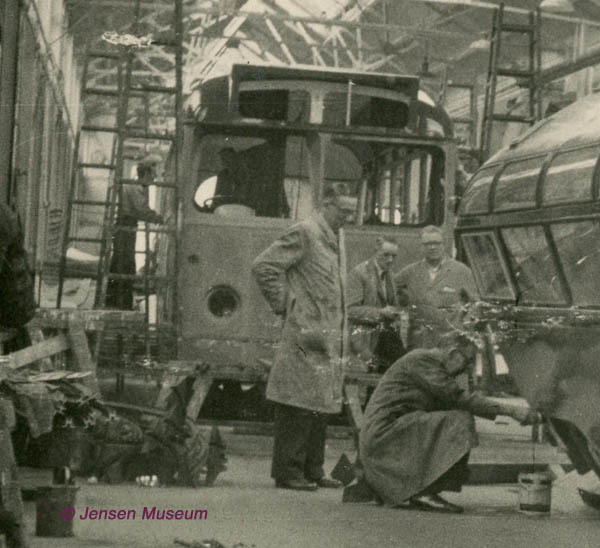 One of the many little known facts about Jensen Motors, is their foray into the world of bus and coach building. 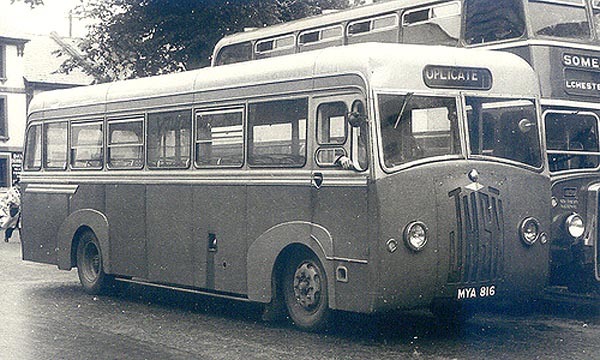 Between 1948 and 1951 the Company are thought to have made as few as ten bus and coach chassis, which were then built up with coachwork by independants. 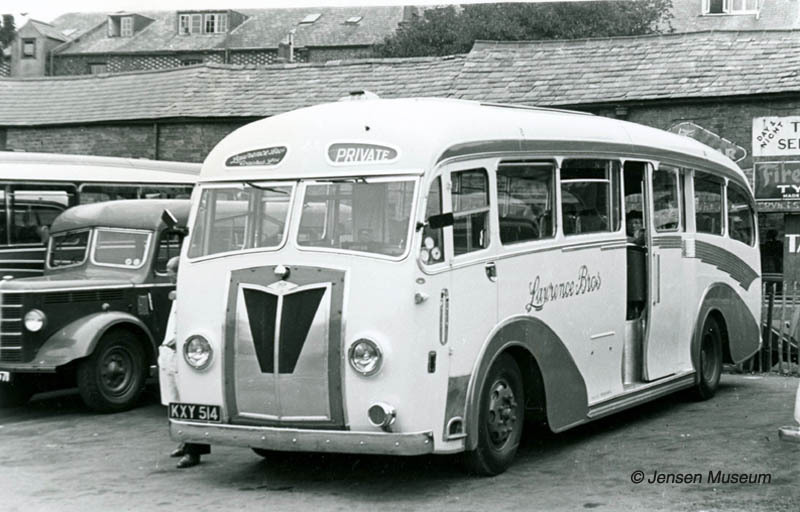 Former IT engineer, David Powell, has researched the world of bus and coach manufacture, and in particular bus and coach building by Jensen Motors. 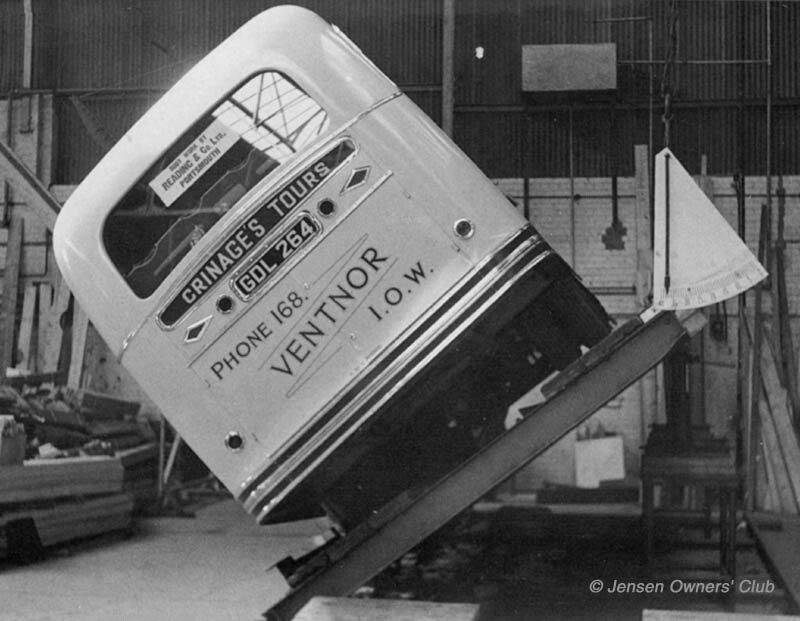 Powell’s research gives an insight to why Jensen’s bus & coach chassis building was doomed to fail. In addition to the Jensen Light Commercial (JLC) which was released in 1946 and the Jen-Tug in 1947, Jensen Motors looked for another market to explore. The glory days of bus and coach building at Smiths during the 1920 & 1930s. Perhaps the Jensen brothers thought they could resurrect this side of the business. The J.C.Lloyd coach was being built up for J.C.Lloyd, who described himself as a ‘Cash Grocer’, with shops in Shifnal and Ironbridge in Shropshire. 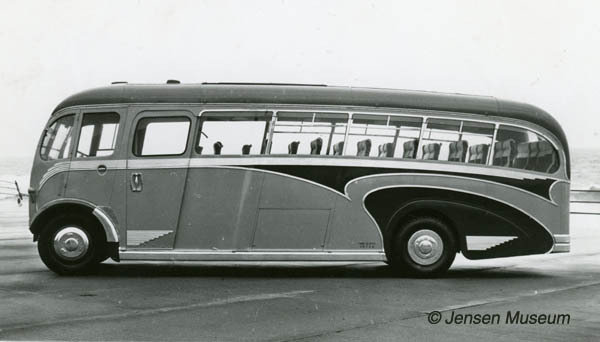 The Jensen brothers already had some knowledge of passenger coach or bus building from their pre-war days with Smiths. It was a market sector they had left, and were now looking to return to. 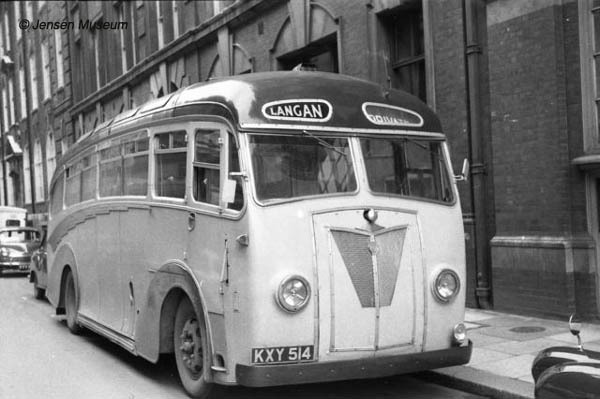 Work started in the immediate post-war years, and the first example of the firm’s return to coach and bus building was announced in September 1948. Designated as the JP1 (Jensen Passenger 1), the design was loosely based on the Company’s Jensen Light Commercial. The new JP 1 shared the Perkins P6 diesel engine, but used a David Brown gearbox with overdrive, giving a top speed of around 50 mph. The prototype, with Jensen’s aluminium chassis and Sparshatts tubular body framing, was on show at the 1948 Commercial Motor Show. Directly afterwards it was completed by Sparshatts as a front-entrance bus. By 1949, Jensen Motors re-designated the JP1 as JLP1. As with the JNSN lorries (JLC), the JLPs retained the distinctive JNSN radiator cover. This went against the trend of most chassis builders who were more inclined towards discreet badging. That said, the JNSN radiator panel also had a bonfide purpose. It allowed for easy removal of the panel, and then for the entire engine unit to be disconnected and removed from the vehicle quickly. 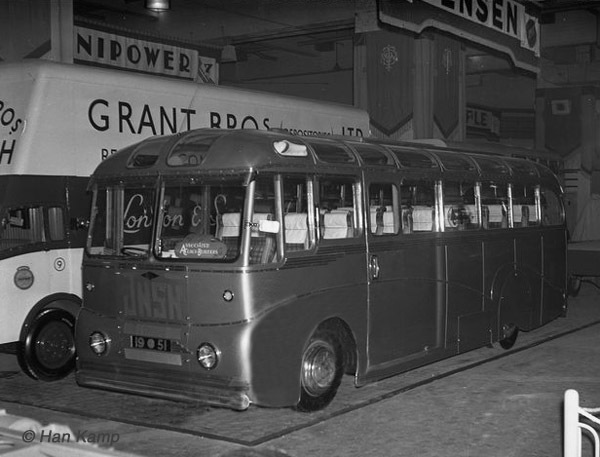 In December 1949 the first prototype of the Jensen JLP1 passenger chassis visited the Manchester area while on an extensive demonstration tour. The vehicle was unregistered and carried the Jensen works plate 1 AEA. It was distributed by North-West area Jensen dealership J R Evans of Cross Street, Manchester 2. The skeleton JLP finished with Sparshatts tubular steel frame. This skeleton was on show at the 1948 Commercial Motor Show, before being finished off with coachwork and entering passenger service. The Sparshatts-bodied JLP in its completed state, and being test driven by Jensen Motors before it enters passenger service. The bus has Jensen Motors’ works number 1 AEA attached for the testing. 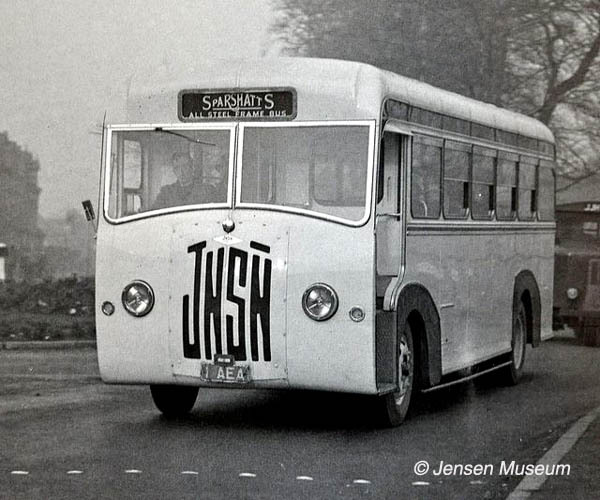 A further image of the Sparshatts-bodied JLP in its completed state, and being test driven by Jensen Motors before it enters passenger service. 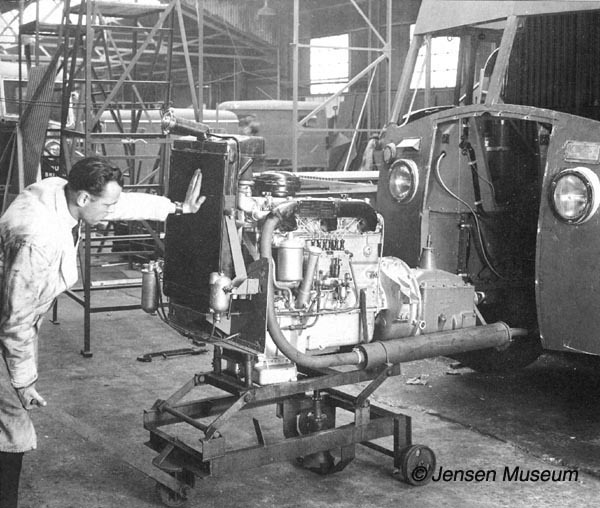 A complete engine / transmission unit being refitted to a JLC at the Carter’s Green works. Jensen’s design made the removal and refitting of the engine / transmission quick and easy. An order came from Hutchings & Cornelius of South Petherton, Somerset, for two buses. The first prototype which was assigned the registration number MYA 391, and then in July 1950, a second vehicle (which had already been built as a “speculative” sale) was assigned the registration number MYA 816. 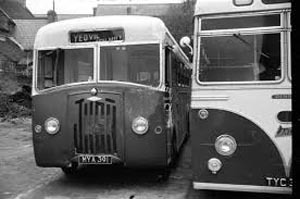 Both buses remained in service with Hutchings & Cornelius until 1964, at which time the were disposed of. MYA 816 en route for Yeovil. Photograph probably taken in the early 1950s. MYA 391 photographed in 1962. 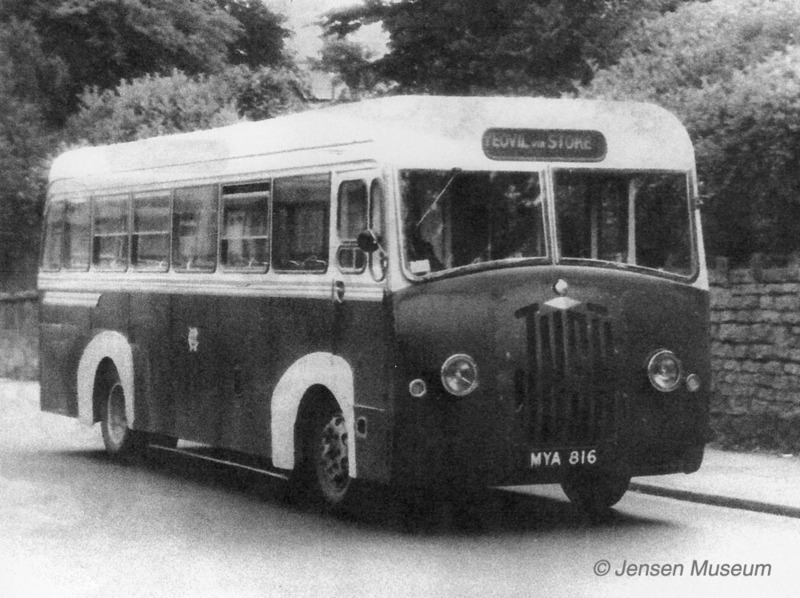 MYA 816 photographed in the late 1950s. “I remember travelling on the two buses many times, particularly to work in Taunton. In the winter they were rostered on the route via Isle Brewers because they were very good at passing through the floods in Isle Brewers and over the River Isle to Fivehead. I wonder if they were bought especially for their capacity to pass through deep water. I recall one occasion when the driver stopped at the top of Fivehead hill, came round and changed into wellington boots and told us to take our luggage up off the floor. He set off through the flood which at is deepest was running through the sunken footwell to a depth of several inches. There was a door to the passenger compartment which ran on rails behind the drivers compartment. When the buses were converted for one man operation an operating lever was fitted behind the drivers seat, which possibly caused injured backs amongst the drivers. At the same time the drivers seat was boxed in and a ticket machine and cash tray fitted. 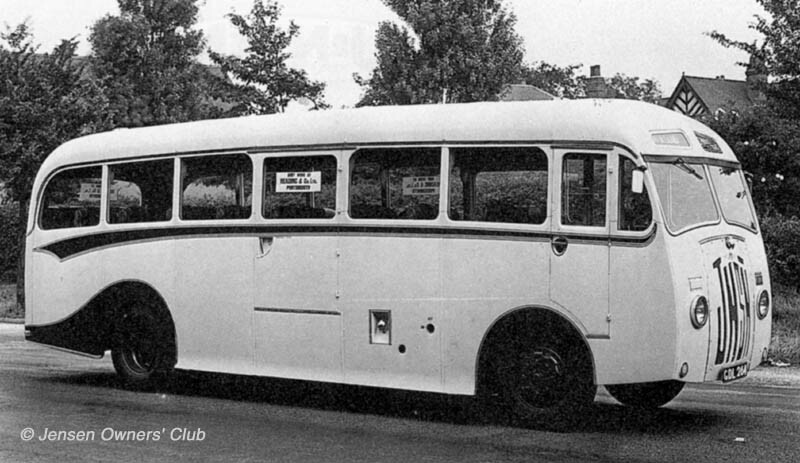 Between 1949 and 1951 three coach versions of the JLP were produced for small operators. One went for use in London with a Strachans body, one to the Isle of Wight with a Reading of Portsmouth body, and the third to County Durham with ACB (Associated Coach Builders) bodywork. KXY 514 with bodywork by Strachan, the coach was new to Lawrence Bros who operated from East London.The JNSN front panel has been changed on KXY 514. It may have been that either Strachan or the transport company didn’t like the idea of Jensen having such an obvious advert on the front of the vehicle. A later photograph of KXY 514, after disposal by Lawrence Bros. Langan may be Langan Ltd who were groundworks and drainage contractors in London. They were probably using KXY 514 as a staff bus. 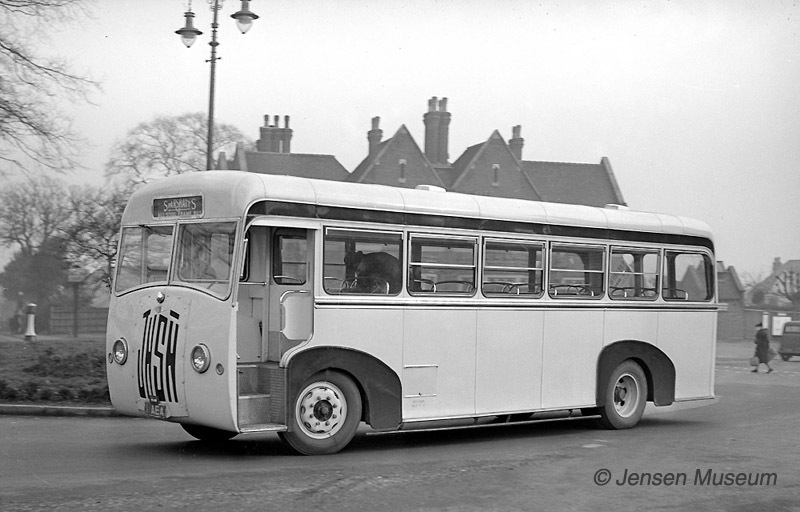 GDL 264 with JLP chassis and Reading of Portsmouth coachwork. The coach is undergoing tilt testing at Carter’s Green. Rear view of GDL 264 on tilt test. The completed GDL 264 sold to Grinages Tours on the Isle of Wight. By 1951, just three years after the announcement of the Jensen Passenger coach, it is believed just ten JLP1 chassis had been completed. 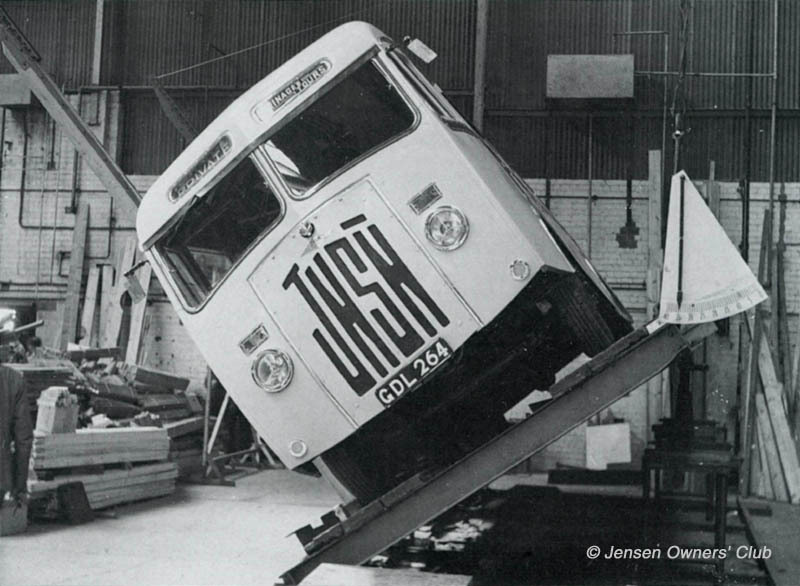 Additionally, Jensen undertook contract coach work for companies using non-Jensen chassis. A flamboyant coachwork style. The chassis isn’t a JLP, which means a chassis was given over to Jensen Motors to finish the coachwork. Jensen’s expensive aluminium chassis may have been the reason for some companies sending a steel chassis from another maker for Jensen to undertake the coachwork. 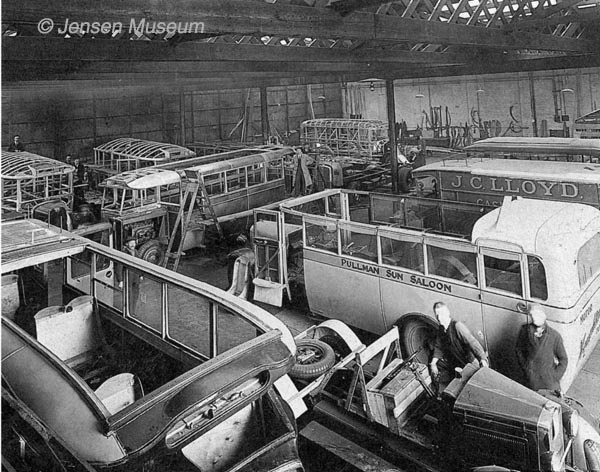 A bus being built up at the Carter’s Green works. The chassis is probably from another supplier, and the coachwork is so-called Federation Coachwork. This was coachwork of a generic style used by many coach builders. Men are working on a Tempo, which dates this photograph to at least 1958. After just a three year time span, it seems the Jensen brothers dropped the JLP and JLC, just continuing with the more profitable Jen-Tugs. In part, the demise of the JLP and JLC was probably down to the expensive all aluminium chassis, which Jensen Motors were using. Obviously, the aluminium chassis was key to reducing overall weight to under 5 ton, but it did make a JLP chassis look expensive against its competition. In fact the JLP chassis was a clear 25% more expensive against its direct competitors. 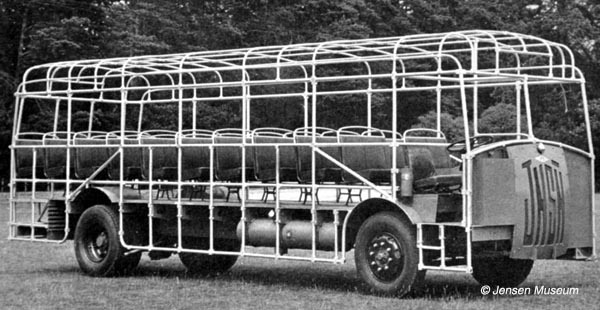 The only other aluminium chassis passenger vehicle came from the firm Bristol. 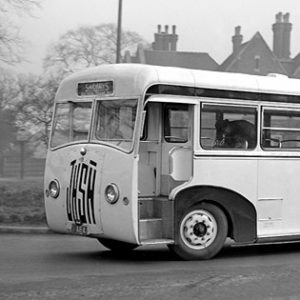 They manufactured two prototype LS buses with aluminium chassis, although when they moved to production they changed back to steel. Possibly Jensen Motors might have received more orders for their JLPs if they had gone with steel and been in a position to discount the price by 25%. As of today, no Jensen bus or coach is known to survive.